Moteino began as a low power wireless Arduino compatible development platform based on the popular ATmega328p chip used in the Arduino-UNO. 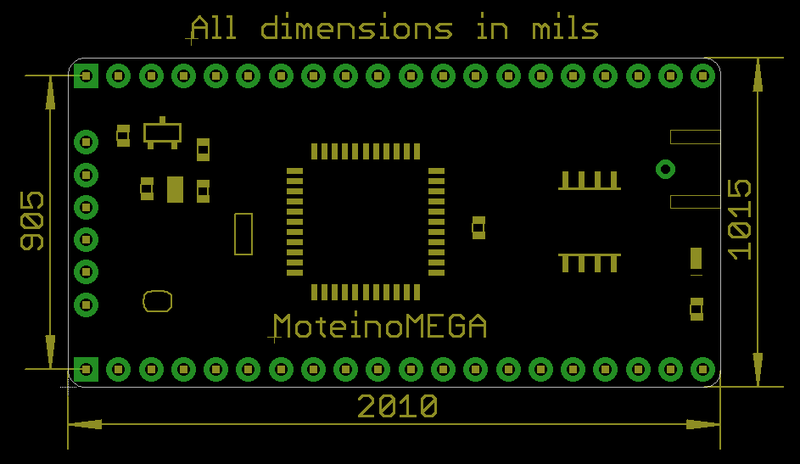 There are now several Moteino development boards including MoteinoMEGA based on the Atmega1284P and MoteinoM0 based on the SAMD21G18 Cortex M0+. 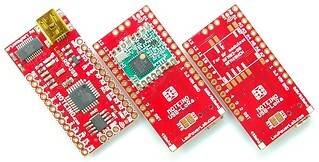 For programming you will need an external FTDI-Adapter to load sketches, the advantages being lower cost, smaller size. 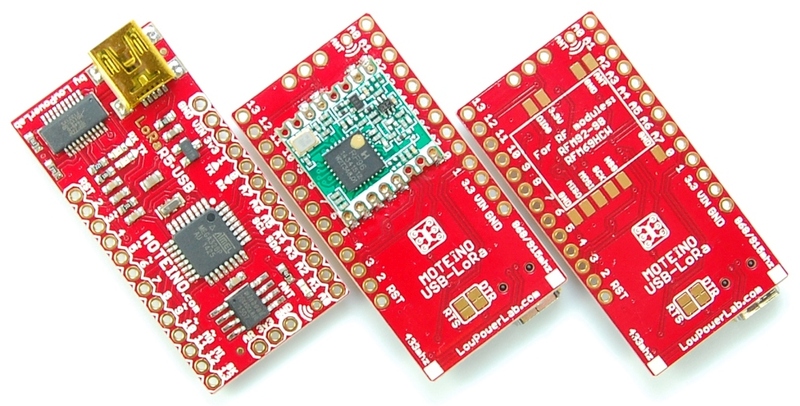 The MoteinoUSB and MoteinoMEGA-USB variant includes the USB-serial converter. 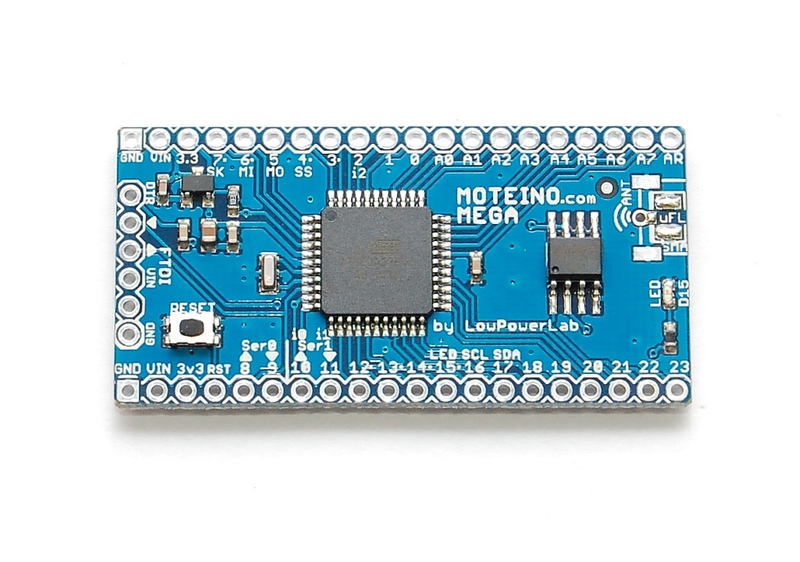 Moteinos are compatible and can communicated with any other Arduino or development platform that uses the popular HopeRF RFM69 or LoRa transceivers, or even the older RFM12B. 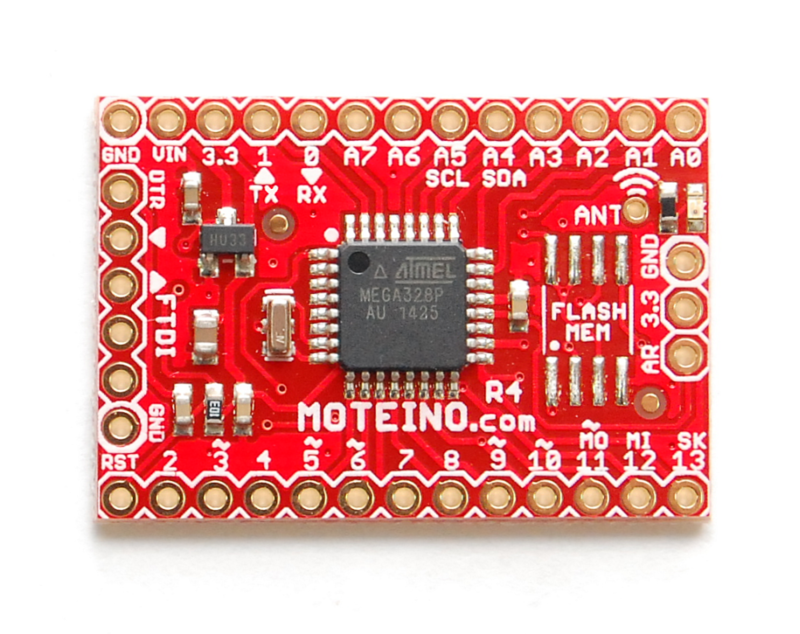 Moteino also comes with an optional SPI flash memory chip for wireless programming, or data logging. The MoteinoMEGA uses the Atmega1284p microcontroller. It still runs at 3.3V/16Mhz but has 128KB of internal flash (vs 32KB on Atmega328p), 16KB of RAM (vs 2KB), 4KB EEPROM (vs 1KB), 2x hardware serial ports, 8x PWM pins and bunch more GPIO pins. Still a small board at just 1.0×2.0″ and breadboard friendly. Comes with the same DualOptiboot bootloader making it “OTA” wireless programming capable, and can take up to 16V of input on the VIN pins (MCP1703 regulated). 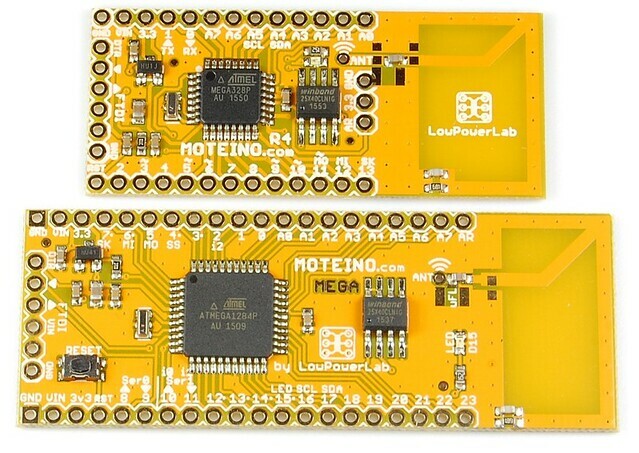 There are also two special Moteino variants with integrated PCB trace antennas, these are available for Moteino and MoteinoMEGA. 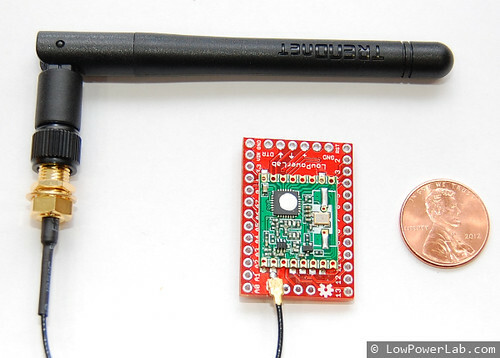 The PCB antennas are tuned for the 868-915mhz bands and have an excellent performance given their compact size. 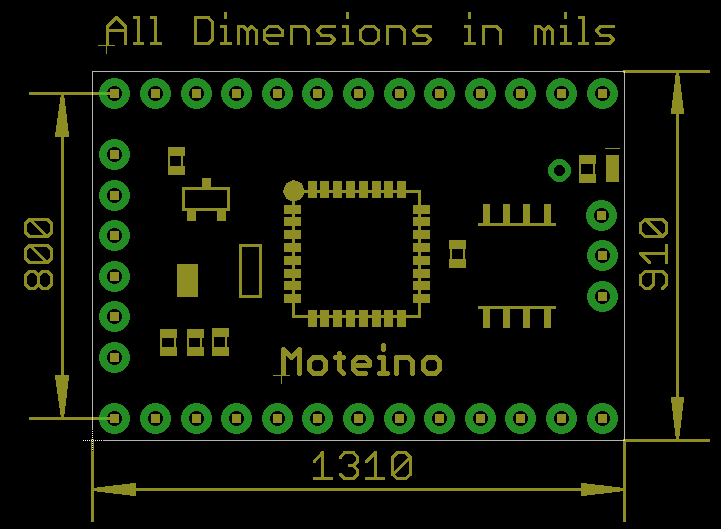 Other than the PCB antenna, they are identical and work the same as regular Moteinos. 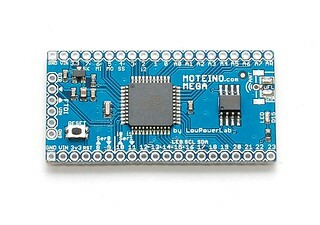 Moteinos come without any soldered headers or antennas. 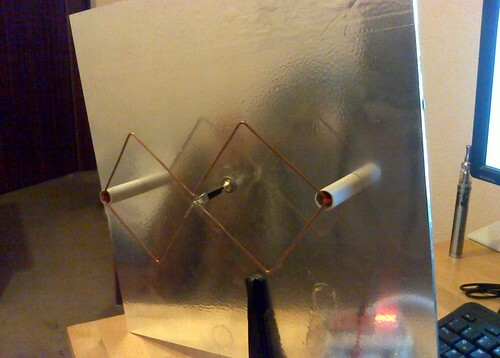 Without the wire antenna the range will be only a few feet, and while this is OK for testing purposes it’s recommended that an antenna be soldered before real application use of the transmitter. The provided wire monopole antenna has to be soldered to the “ANT” pin hole (just above the FLASH chip) to achieve any usable range. 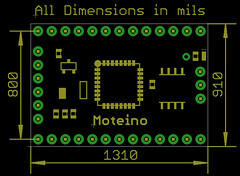 Regular Moteinos will come with a 1×6 male header that you have to solder before you can power it and upload sketches through an FTDI Adapter. 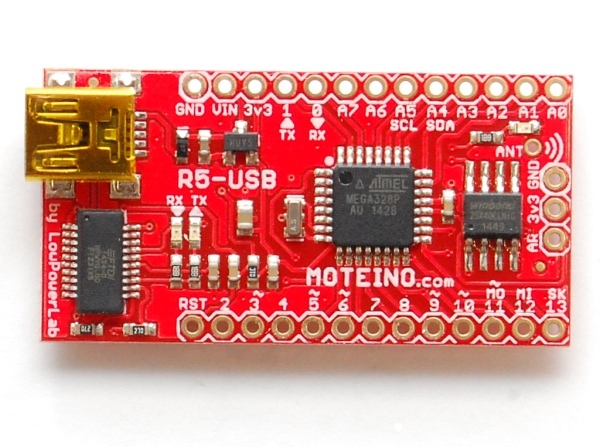 Moteino-USB has built in USB so you only need a mini-USB cable for programming. * DualOptiboot is a modified version of the standard Optiboot bootloader (size is 1k instead of 512bytes). For plain FTDI/serial programming you can still use the Arduino Uno target for uploading to a Moteino, as long as your sketch won’t exceed 31KB. 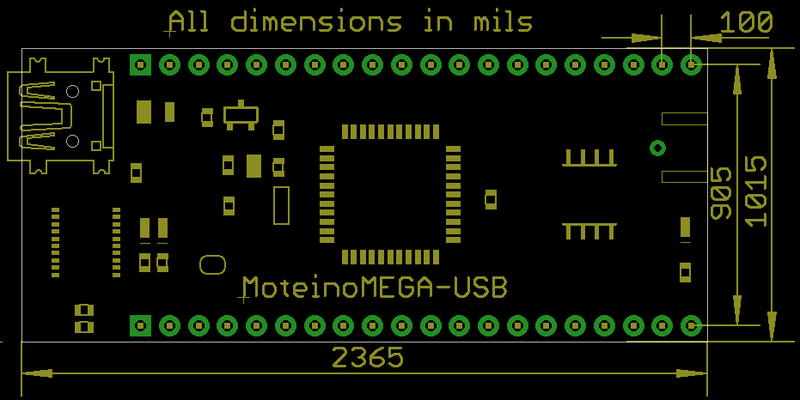 To avoid issues and support MoteinoMEGA, you should install the Moteino Core which contains the definitions for all Moteino boards. must be powered from 3.6v or less when RFM radio and/or FLASH-MEM are installed. The RFM radio and FLASH-MEM are damaged by 5V. 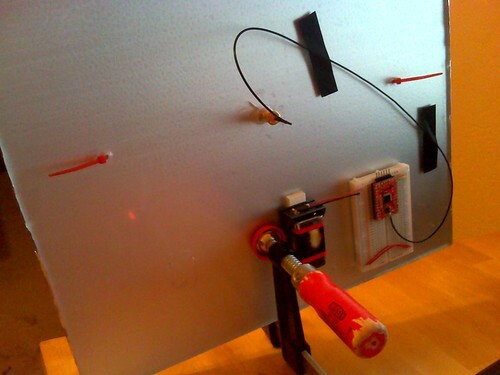 Without these components the board will work up to 5V. These types of Moteinos are ideal for ultra low power coin cell and other micro power powered nodes – power them from 3.6V or less. Of course, when you have such tiny power supplies, you must choose your transceiver carefully, as you likely cannot transmit at full 20dBm power from a tiny coincell. The W/CW 13dBm radios running the auto-power-dial RFM69_ATC library extension would be recommended for running on coin cells or small solar cells. Here is a quick side by side comparison of different HopeRF radio transceivers. There are different aspects of compatibility between them which we discuss below. For the transceivers to work properly with the RFM69 library, you must always check the radio settings in your sketch. Particularly the RFM69HW and RFM69HCW radios require invoking radio.setHighPower() after radio.init() (usually controlled by the #define IS_RFM69HW_HCW directive), see how this pattern is implemented in the library examples. For RFM69W & RFM69CW you should *not* call radio.setHighPower() – ie comment out the #define IS_RFM69HW_HCW line. 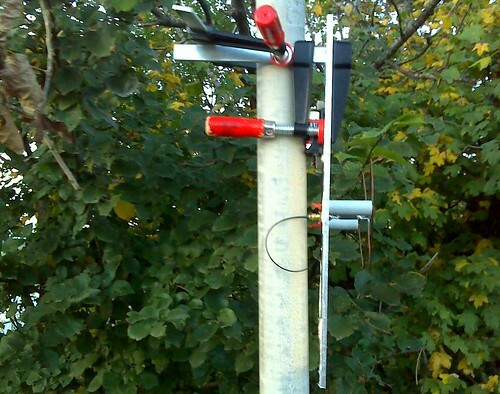 Doing this incorrectly will result in no wireless range and can even damage your transceiver! What is the difference between W/CW/HW? The W/CW/HW are different configurations of the same Semtech SX1231h transceiver chip (custom packaging by HopeRF). They come in different transmission power and frequency variants. For instance the W and CW are 13dBm power output. The HW and HCW are 20dBm power output. All RFM69 radios can communicate with each other regardless of their configuration/layout (as long as the above settings are correctly set) when their network ID and encryption (optional) keys match. Their node IDs should be unique, the RFM69 library supports up to 255 nodes per network. 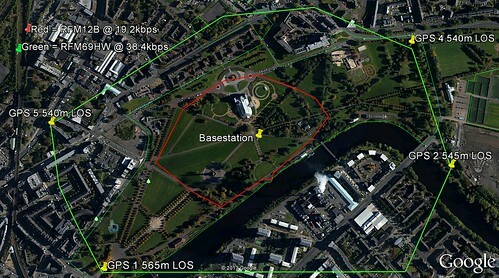 The broadcast address is 255, sending a message to that node ID=255 will make all listening nodes receive that message. The W and HW are pin compatible. 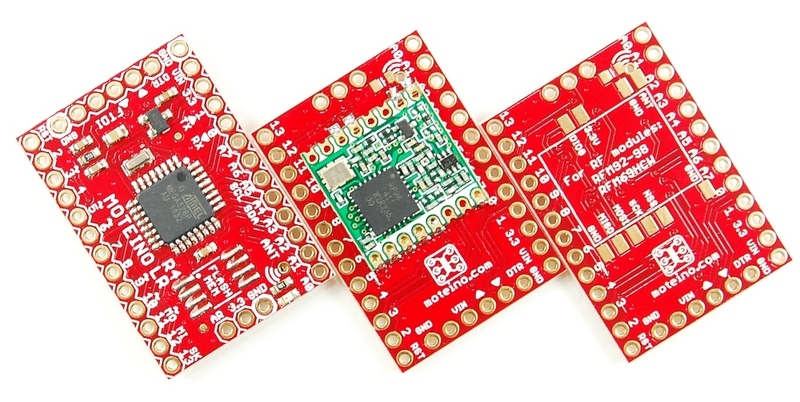 The HCW are only pin compatible with the RFM95/96 LoRa radios. The CW radios are pin compatible with the older RFM12B. The W and CW are equivalent in coding and settings usage, and same is true for the HW and HCW. In fact, the only setting difference between W/CW and HW/HCW is the very important #define IS_RFM69HW_HCW directive discussed above. Since it’s not easy to distinguish between the same radio of different frequencies (except marked on the bottom by HopeRF), LowPowerLab has its own marking convention for the transceivers to quickly identify frequency once they are soldered to Moteinos. The 433mhz radios are marked with a gold dot. The 868/915mhz are marked with a silver dot. Other vendors also mark their HopeRF radios but have different colors. RFM95 and RFM96 are *not* compatible with RFM69 and require a 3rd party library, see the LoRa page for details. However RFM6 (HCW only) and RFM95/96 LoRa radios are pin compatible, enabling them to share the same mounting pads. RFM95 and RFM96 can be confused because they both have a chip marked with “RF96“. They are in fact different, as can be noticed in the photo above. Although the chip is the same, the components are mounted differently, reflecting their different frequency operation. The markings on the back of the module also makes this distinction. RFM12B can be used on Moteino/MoteinoUSB/MoteinoMEGA but this radio is not supported for new development and older code/library is only kept for reference. 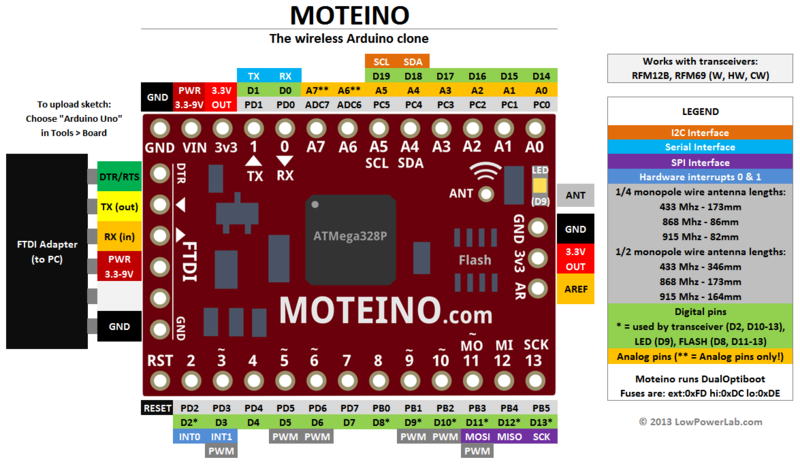 You will need to install the Moteino package in your Arduino IDE – this includes definitions for all Moteino boards and MightyHat. First add the Moteino core json definition URL to your Board Manager. The VIN pin of AVR Moteinos is shared with the VIN pin on the FTDI header. If you power your Moteino externally from the VIN pin, make sure to disconnect the external source when you attach the FTDI-Adapter! The FTDI header has silkscreen markings for the GND and DTR pins to help you align your FTDI Adapter (black and green wires respectively on the FTDI cable). Usually the PCB based FTDI adapters also have the same markings on their end (see the FTDI Adapter). 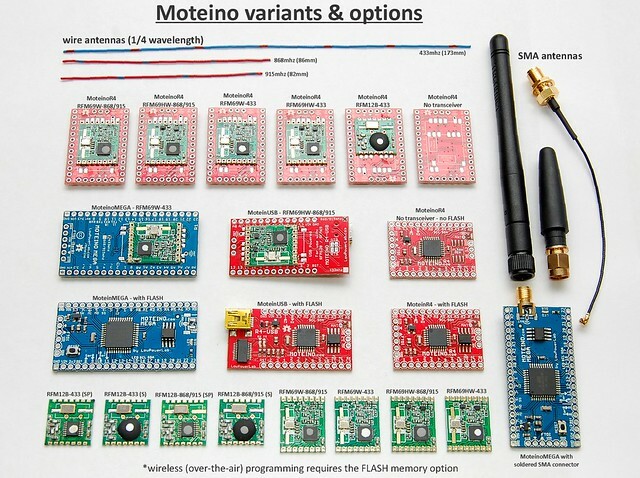 The Moteino can be used like Arduino, but for wireless communications you will need a library for the RFM69 transceiver. You can use the official RFM69 library for RFM69 Moteinos, it has a suite of examples to get you started. The simplest way is to start with the Node and Gateway examples. For RFM95/96 LoRa transceivers please see this section for more details. See this official tutorial on installing Arduino libraries if you’re not sure how to install an Arduino library. 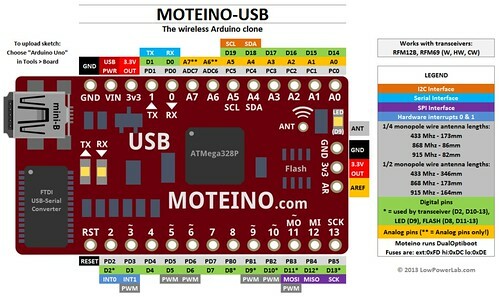 All Moteinos come with the DualOptiboot bootloader which enables them to be wirelessly programmed when the FLASH MEM chip is installed (also available separately). 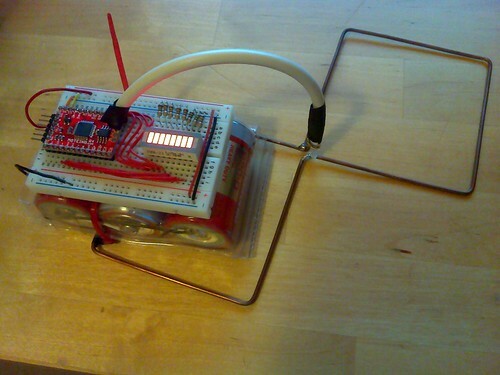 You will need to program a Moteino with a sketch that listens to such wireless programming commands first before it can be programmed over the air. There’s a proof of concept and source code described in this blog post. You can now use the OTA.py python script cross platform which does the same thing as the Windows application except it needs to be passed command line arguments (com port, baud, hex file etc) – type python OTA.py -help for details. The OTA.py script is now bundled and can be invoked in the Windows application. 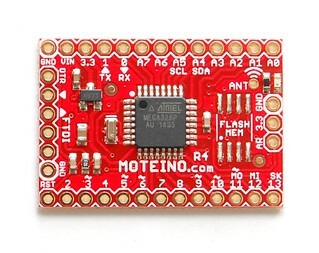 The FLASH-MEM option was introduced in Moteino R2 to allow SPI flash memory (SOIC JEDEC 3.9/5.3mm body width package) to be added to Moteinos primarily for wireless programming (but can be used as non-volatile storage for any purpose). There is an SPIFlash library just for using this memory chip. The SPI CS select for this is connected to D8 on all Moteinos (D23 on MoteinoMEGAs). The chip shipped on all Moteinos is the Windbond 4mbit W25X40CLSNIG. Higher capacities are available upon request for custom batches. Why flash chips and not SD cards that come in much larger sizes at low cost? Because of the size and power constraints, an SD card slot would increase the cost. A separate SD-card Moteino shield would be more appropriate for an SD card add-on.